Wales and Scarlets full-back Leigh Halfpenny has said he feared for his career after suffering a head injury. 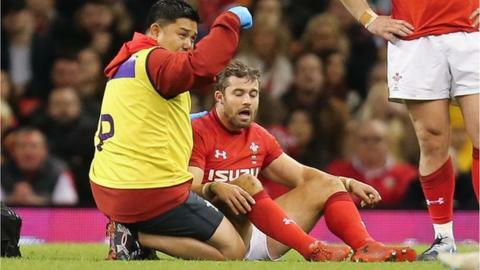 Halfpenny was out for three months with concussion after suffering a head blow against Australia in November's autumn Tests. The 30-year-old said he endured a "frustrating" time on the sidelines and admits the possibility of not returning to action played on his mind. "If I'm being honest it did," Halfpenny said. "There was a point where I was constantly having headaches and was trying to do something on the bike or jogging and my head would be pounding from it." Halfpenny, who said he had spells when he felt close to a comeback only to suffer a setback, added: "You were thinking when is this going to end. It was a tough one. I'm delighted to be over it." Halfpenny was cleared to return to action for the Scarlets at the end of February and has since played three games for the region. But the former Cardiff Blues and Toulon had to contend with watching from the sidelines as Wales secured a Six Nations Grand Slam. "As a competitor you want to be out there on the field, but it wasn't to be," Halfpenny added. "But I was delighted for the boys and for us a squad to achieve a Grand Slam is a massive achievement especially ahead of the World Cup. "It was a great camp and a great squad to be a part of. The boys worked extremely hard." Liam Williams started at full-back in Wales' five Six Nations games and Halfpenny admits he faces a challenge to win back his place in the team. "The back three in the Six Nations were absolutely outstanding and there's a lot of competition for places in the back three," said British and Irish Lion Halfpenny. "It's about putting in the hard work." Halfpenny says the focus for now will be Scarlets' bid to reach the Pro14 play-offs and their three final games of the regular season against Edinburgh on Saturday, 6 April in Llanelli, then Zebre and Dragons. "Hopefully we can get a place in the play-offs and push for that Pro14 title. "We've got a huge challenge ahead of us now with three games left and three that we must win. "Edinburgh are a side were competing with for a play off spot so for us it's a massive game and a must win." "Rugby has been a huge part of my life and still is, but now I've got a daughter to think about," he said. "It certainly changes your perspective on life. "I'm loving being a dad. It's a special time."